I have 2 bikes (mountain and road) sometimes I use them in races (mostly MTB) so I don't want to have any fixed accessory on them. I'm looking for a child seat (or rack where a seat can be mounted) that goes mounted to the seat-post so that I can easily replace the seat and post and mount the seat. I've seen some mechanisms that go into the frame. I thought they could also be mounted in the seat post but I'm afraid it's not a very good idea as the seat and baby weight would be too high and compromise stability and safety when riding. Does anybody have any idea? I'm afraid I'll have to get another bike for that purpose :-P.
I have also though of bike trolleys but they may be too big, expensive and too sluggish. Seat post racks have limited carrying capacities, and none of them are safe for carrying children. A rack specifically rated for heavy loads is the only safe way to attach a child seat. Do you want your seatpost rack collapsing with a child in the seat? If you don't want to put racks on your bikes permanently but use your existing bikes, you can acquire a child trailer (is that what you mean by a "bike trolley"?) and put a hitch on each bike. That'll fit your requirements of not installing anything on the bikes (except the trailer hitch at the rear axle). There are trailers available that are surprisingly light, but you're correct that they can be expensive. But a new bike will be more expensive, unless it's a terribly cheap one - and do you want your child carried on a bike like that? The closest thing I have seen is the WeeRide Kangaroo that places the child in front of you. the support bar attaches to the seatpost and to the head tube, so if you had a second seat post you could leave the bar attached to that end and just connect it at the head tube. I don't know of anything that attaches just to the seat post, as the physics involved would cause pretty high torsional force at the point of attachment. See this related question on toddler seat v. trailer for other child carrying options. I would definitely try to get rid of one of your constraints: attaching things to the frame. Unless you are riding carbon (in which case ANY child-carrying device would be practically "forbidden"), it is not to difficult to "build" or adapt a rear rack to the lower seatstays. 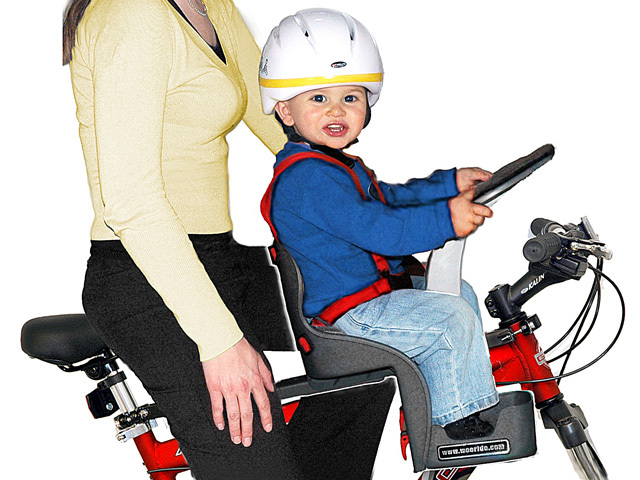 I have ridden with my kid until he had 50 pounds, and getting him firmly supported from below (via the rack legs attached directly to the frame) was very important. Also, I had a handlebar mounted to the seatpost, and a generous foam padding (I made this seat at home). Riding with a kid "hanging" from the seatpost is something I would strongly advise NOT to do, both for mechanical safety and also for father's balance and control. Not the answer you're looking for? Browse other questions tagged rack seatpost child-seat or ask your own question. What is the minimal seat post depth?